Having bought my first Latin music records back in 1982 and also played salsa records at DJ gigs for the first 1/3 of my salsa DJ career (1982-1995 – after that salsa CDs replaced salsa vinyl), and amassed a collection of 1000+ salsa/Cuban/Latin records and still growing, I thought it’s time to play them out more. Recent salsa vinyl gigs at some of my own Leeds live gigs plus guesting at “I Like It Like That” vinyl session London and the Mambo City London Salsa Congress 2018 vinyl room, it’s got me excited for playing classic salsa, mambo, Cuban records again. It’s not just about rare music or the sound of vinyl. Playing vinyl is fun. That’s why I never gave up on it with my soul, jazz, funk, reggae and hip-hop DJ sets. Now I want to play more salsa records again. Over the last 10 years, the resurgence of interest in vinyl is mirrored in the salsa scene and across the world, a new underground salsa vinyl scene has grown steadily. In the UK, DJ Erick Joel Lopez’s “I Like It Like That” sessions championed 100% vinyl salsa sets and it inspired more nights in London and a few other cities across the UK (including Leeds with Mark Johnson’s Salsa Rocks Grande vinyl sessions). Guest DJ is the daddy of the UK salsa vinyl resurgence, Dominicano Erick Joel Lopez from London. Erick’s “I Like It Like That” session since 2014 has been at the forefront of the salsa vinyl revival here in the UK. Now approaching it’s 25th session, it has featured the finest salsa vinyl DJs from across the world. Erick is also one of the capital’s top salsa DJs working at places like S.O.S. and Bar Salsa. We had some great times spinning together in the past at Calle Ocho Leeds, “I Like It Like That” London and at this year’s Mambo City London Salsa Congress vinyl room so it’s great to have him guesting at this debut Manteca party. The man’s got tunes!! We’ll be playing all our favourite salsa and Latin music on vinyl including classic salsa, mambo, son Cubano, cha cha cha, songo, salsa romantica, guaguanco, Latin bugalu and also contemporary salsa releases on record. Guest danceteacher is Gormack Dione, who has been teaching salsa for 19 years and dancing it for even longer. He’s lived and taught salsa classes in Paris, Spain, London, Leeds and now Manchester and been a guest teacher at many salsa congresses/festivals across Europe. It will be intermediates level crossbody salsa on1 and kicks off at 9pm sharp so get down early. Hope to see dancers from across the north at this session. 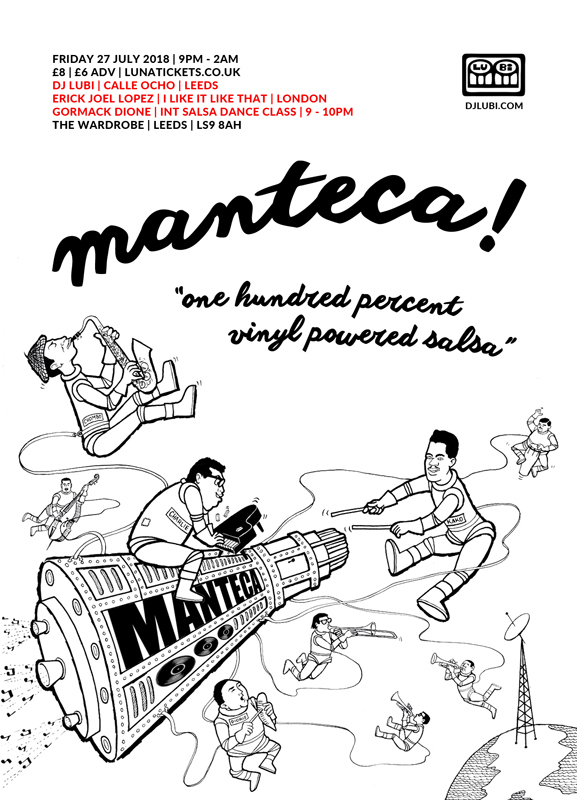 If you come and support, then there will definitely be more Manteca sessions at The Wardrobe Leeds. For more info, check www.djlubi.com or email info@djlubi.com or here on Facebook via this Calle Ocho Leeds page.